A very hardy 25 year old Turkey Oak (Quercus cerris) outdoor bonsai in very traditional classic ceramic pot. The trunk is powerful, extremely artistic in styling and has a beautiful taper. An extremely well proportioned outdoor bonsai. Free next working day delivery is available & you may choose the best delivery date at the checkout. Please watch our video below the main image - the details are so much clearer! Thank you. 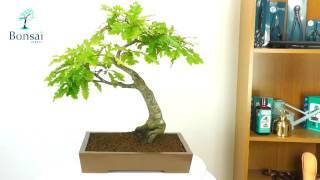 This is an extremely stylish Turkey Oak bonsai with powerful start to the bonsai and lovely canopy. Potted into a classic ceramic bonsai pot, the trunk structure and flow is both powerful & beautifully tapered. Bonsai Pot: Traditional unglazed rectangular ceramic pot. Native to the Mediterranean areas the Turkey oak makes a handsome bonsai with dark green, fury leaves with deep cut lobes. The turkey oak can be very late to lose its foliage in the autumn and often retains some foliage during mild winters. It is an easy tree to care for and should be shaped by pruning. The trunk thickens nicely and the bark is dark grey giving the bonsai a silhouette look.